First, superheroes appeared on the pages of comics, then they slowly began to move into movies and cartoons, and with time they appeared even in anime. 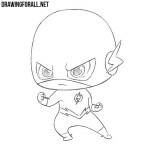 And we decided not to stay away, and create for you drawing lessons about the characters of comics not only in the style of comic books, but also in the style of anime and chibi. 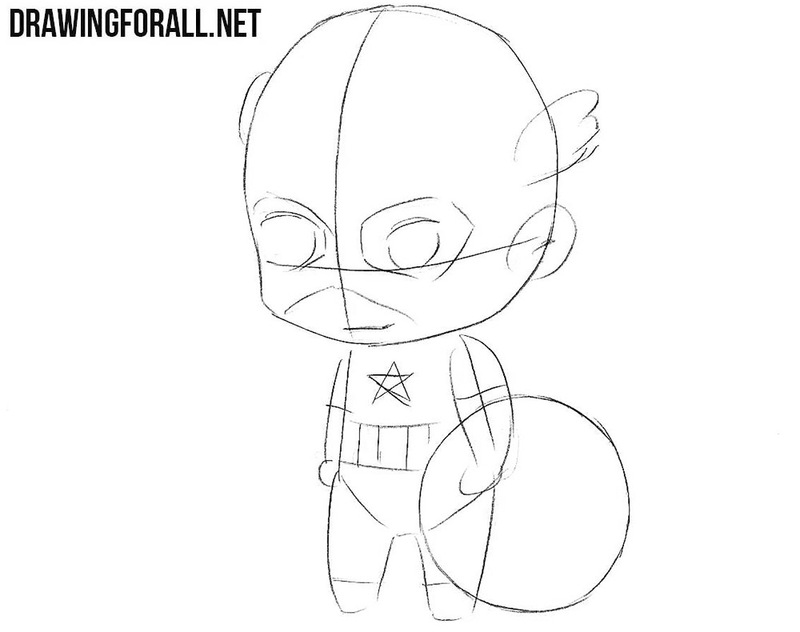 We have already drawn Captain America in the style of classic comics, now it’s time to learn how to draw chibi Captain America. 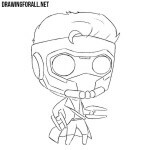 All the lessons of drawing chibi begin with the fact that we draw their heads. 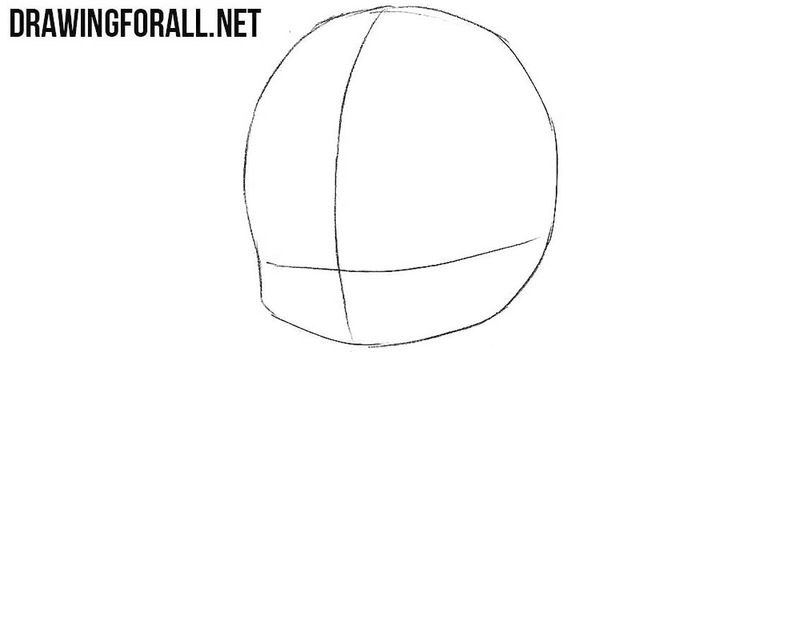 In this lesson, we also first outline a rounded head and then draw two intersecting lines on it. 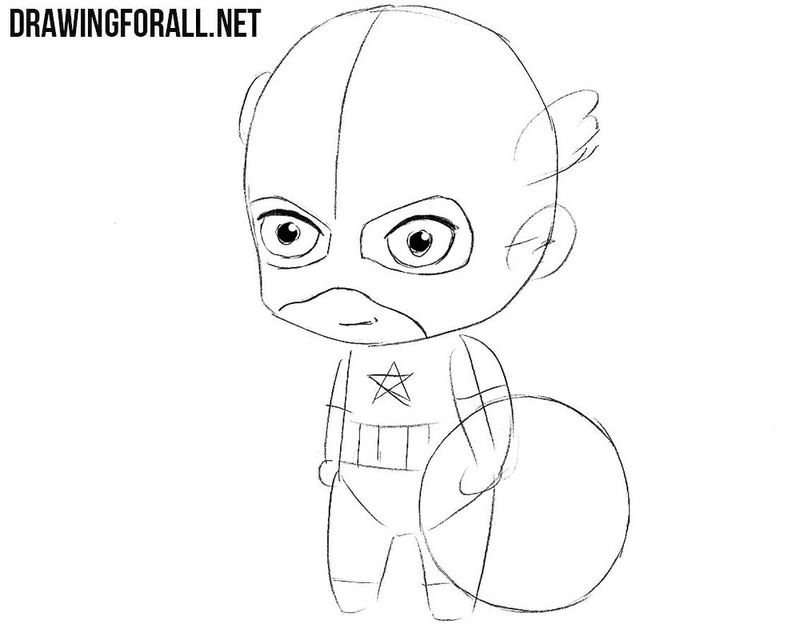 Now with the help of very light lines we outline the disproportionately small body and the disproportionately small arms and legs of chibi Captain America. 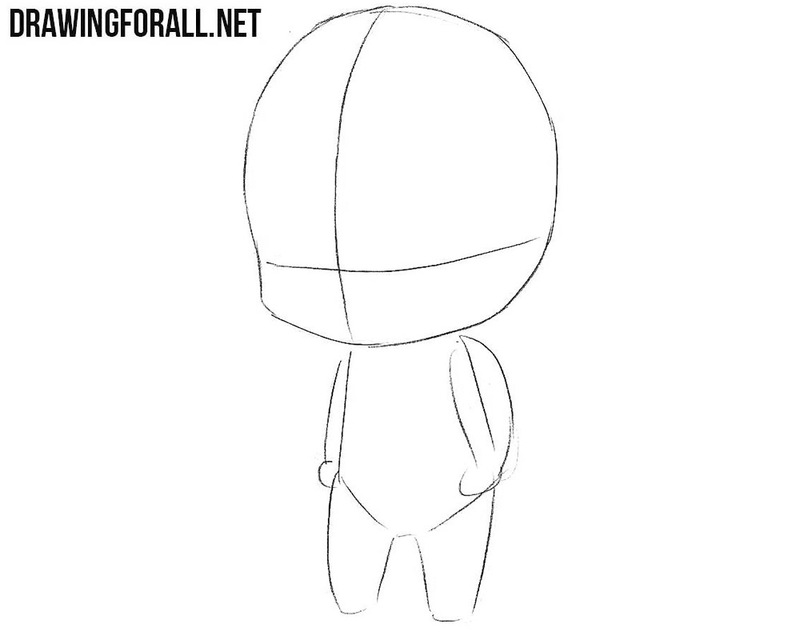 Let’s now outline some of the most basic details. On the head sketch the outlines of the openings of the mask, eyes, mouth and small wings. 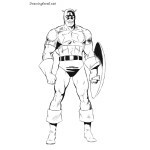 On the body we draw the outlines of the costume, a star in the center of the chest and a round shield. Let’s now work on the final details. Using clear and dark lines, carefully draw out the eyes and glittering pupils in the eyes of our Captain America. Also draw the lower part of the face and mouth. 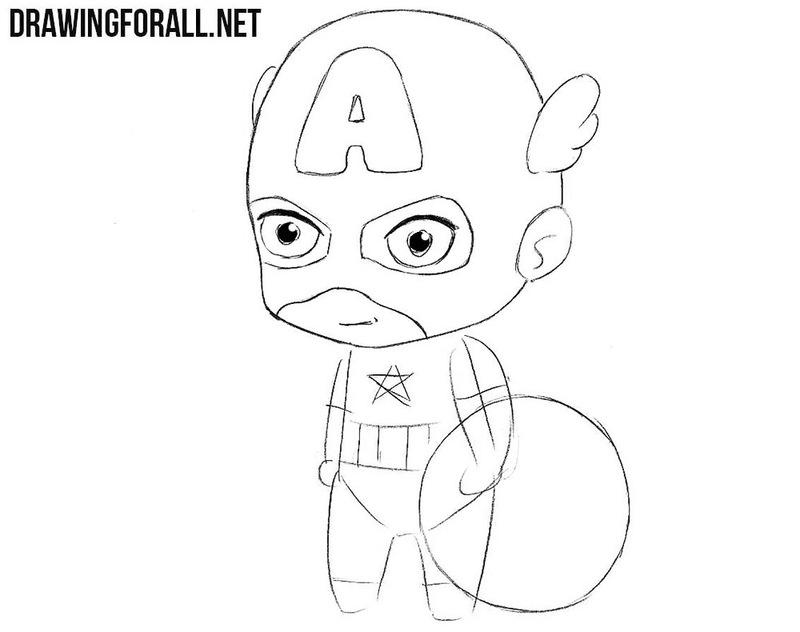 Now we will draw out the top of the head of Captain America. 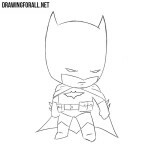 Carefully draw out the outlines of the head, small and cute wings on the top. At the end of the step, delete all unnecessary lines and draw the letter “A” in the center of the forehead. 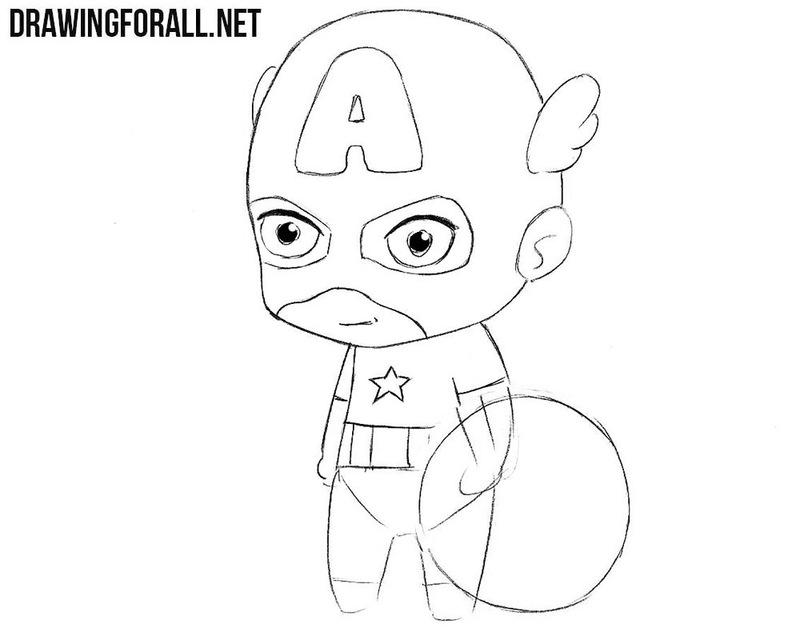 This step will be much easier than the rest of the lesson on how to draw Captain America. Here we carefully draw out the shape of the torso, the costume lines and the star in the center of the chest. Do not forget to remove unnecessary lines from this area. 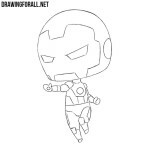 This step will be slightly more difficult than the previous one, as here will be more lines and different details. Draw a belt and small cute legs. Next, draw out the outlines of the shield and details on the shield using clear and dark lines. At the very end of the step, we simply delete all unnecessary lines. 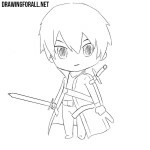 We have already drawn a huge number of different characters from comics and anime in the chibi style and are not going to stop. So be sure to subscribe to us in social networks, share our lessons and visit our site as often as possible, so as not to miss new lessons about chibi.